In 2017, Switch was a new system with few games. 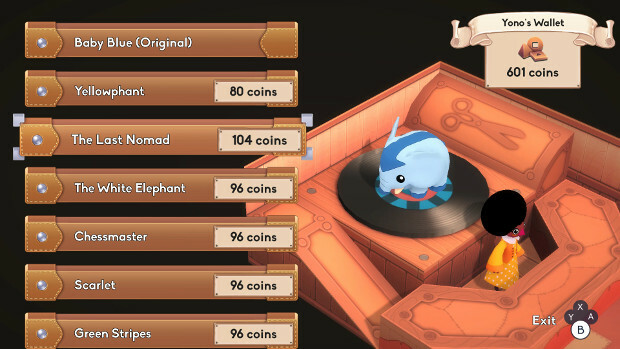 One of the October 2017 releases on Switch, the visuals of Yono and the Celestial Elephants (Neckbolt/Plug In Digital, 2017) game drew some interest... at least on IGN's Nintendo Voice Chat. It looked like a HD mix of Landstalker (Climax Entertainment/Sega, 1992) with maybe a dash of Rolo to the Rescue (Vectordean/EA, 1992), but with more focus on puzzles. However, once the game was released, the 'hype' was quickly lost. A little elephant descends to a world that considers elephants heavenly/celestial messengers and guides. 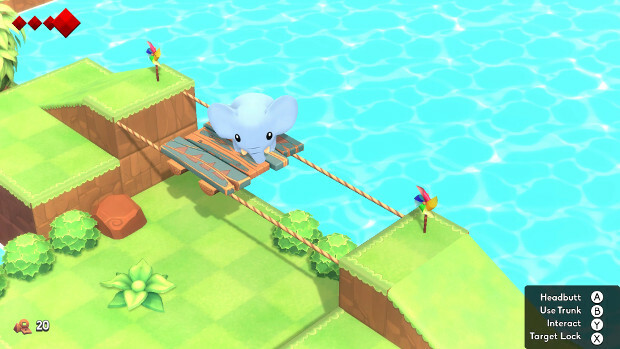 Over the course of the game, the titular elephant Yono tries to find an answer to why they were born to this world and what they needs to do. This means going on a linear quest that involves solving puzzle after puzzle, with trampling a few goblins on the way. Most of the game is a series of puzzles built on only a relatively few concepts, and when the concept is introduced, it typically only stacks on top of the previous puzzles. Unlike in Zelda, Yono doesn't gain new skills but rather the variety of ways the environment can get involved with the puzzles increases. 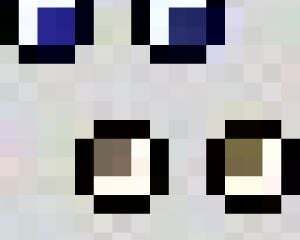 For example, once sliding ice blocks is introduced to the mix, they'll stick around until the end of the game. Pushing "regular" blocks is a tool from the get-go, and that describes a large part of the puzzles. Not to the level of Sokoban (Thinking Rabbit, 1982), but there'll be situations where the player will have to reset the puzzle after pushing a block to a wrong position. Outside of boss fights, fighting is barely a feature: most of it is just dashing at the enemies repeatedly. One problem with the visuals is how static they are. They certainly look nice, but very little moves without the player causing said movement. The waves and the flames, obviously, but the trees and bushes are put. Overall, the world feels more like Duplo than the basic Lego, if that makes any sense. As I was writing this, I had nearly forgotten that there's an option to break vases to collect some currency that is used for little else than purchasing different outfits for Yono. This sounds like a pretty reasonable kids' game. While the puzzles won't get exceedingly difficult with the exception of maybe one or two at the very end of the game, it's the material outside the core gameplay that makes me question what the target audience is. While there is no gore displayed, there is unlockable background lore. On the other hand, there are no voiceovers at all. I would think a fair bit of these stories are influenced by the history of our world, at least in names. 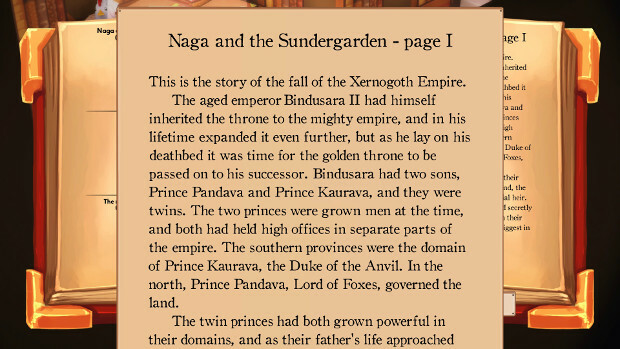 I recognize the names Kaurava and Pandava, but not in this context. There's also the occasional philosophical stuff. An undead Bonewight living in a tub like Diogenes, promoting the virtues of not eating meat. The robots, their Day of Singularity and how the ballots work in contrast to the monarchy of humans in Knightingale. I played the game mostly a full year after its release, so some bugs may have been fixed since. There were only two cases where I broke the gamee: once when I teleported through a barrier, another when I attempted to solve the last puzzle in a wrong way and the camera stopped working. It took me 5-10 hours to finish the game, and even that was too long to play finish in one streak. That I took a long breather in such a short game illustrates the problem the game has: it has no real hook, it's not memorable and it doesn't stray far from utterly average. I usually don't have this much trouble hitting the 500 word lower limit when reviewing a game either. I wouldn't bother with Yono, but people more aware of what type of games children like may want to take a closer look. The game is available at least on Switch, Steam and GOG.